This is the track. Let's get to work. 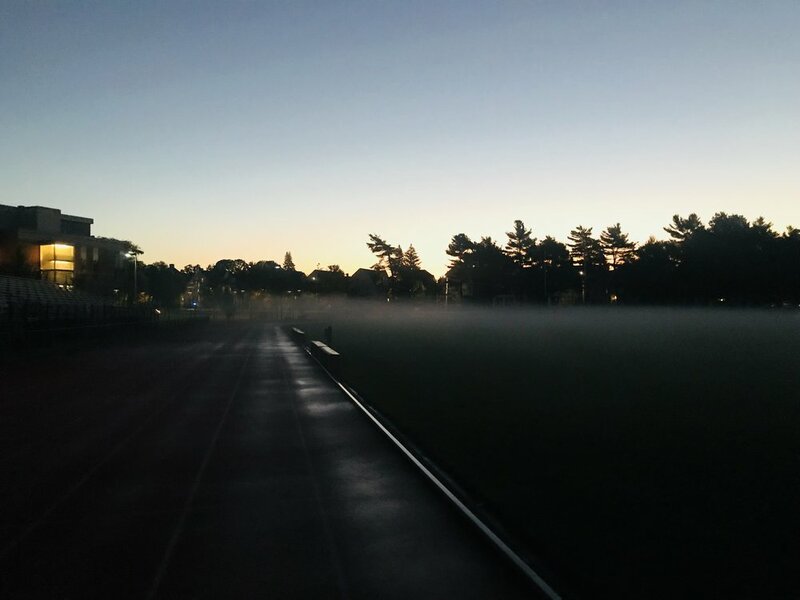 The Tufts track on a Sunday morning, under a thin layer of vapor that just stays there and gets my face wet on every lap. Pretty nice. I would finish teaching at 6 PM, change clothes in the bathroom of the English school where I worked, and walk the two miles to the track for practice every Monday night, lugging all my stuff. At 7 PM, the warmup would begin, and the 20 or so runners in the group would take off down Vassar Street to the river. If I had to guess, I would say that they were running no slower than a 8- or 9-minute-per-mile pace. I had no business then and I would have no business now warming up at a 9-minute pace. But I was there to work hard, right? I trailed the pack, but wouldn’t let myself slow down enough to lose sight of them. Knowing now what an actual warmup is supposed to feel like, I can’t help laughing at the 2011 me, panting my way back to the track to rejoin the group “warmed up” and ready to work. I might have been totally winded and worn out already, but I had saved face by not letting the second-to-last runner get more than 10 paces ahead of me!